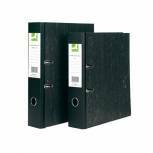 Charcoal A4 Lever Arch 70mm Files (Pack of 10) WX10102 Pack of 10 Lever Arch Files. Durable board files with a mottled cover, large label area, metal shoes, eyelets to hold the file closed and a finger pull helps to retrieve your files easily. Size: A4. Q-Connect Lever Arch File A4 Black (Pack of 10) KF20001 Pack of 10 Q-Connect Lever Arch Files. Durable board files with a mottled cover, large label area, metal shoes, eyelets to hold the file closed and a finger pull helps to retrieve your files easily. Size: A4. Q-Connect Lever Arch File Paperbacked A4 Blue (Pack of 10) KF20039 Pack of 10 Q-Connect Paper on Board Lever Arch Files. Colourful and practical, manufactured from recycled board and paper covers. Features large label area on the spine, thumbhole for easy retrieval, locking slots and metal shoes to protect. A4. Colour - Blue. Q-Connect 70mm Lever Arch File Polypropylene A4 Blue (Pack of 10) KF20020 Pack of 10 Q-Connect polypropylene Lever Arch Files. Smart, durable coloured lever arch files with finger pull for easy retrieval and large label area on the spine for quick identification. perfect for colour co-ordinated filing systems. Size: A4. Colour - Blue. 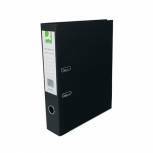 Q-Connect Lever Arch File Paperbacked A4 Black (Pack of 10) KF20038 Pack of 10 Q-Connect Paper on Board Lever Arch Files. Colourful and practical, manufactured from recycled board and paper covers. Features large label area on the spine, thumbhole for easy retrieval, locking slots and metal shoes to protect. A4. Colour - Black. 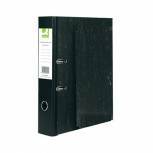 Lever Arch Foolscap File (Pack of 10) WX10100 Pack of 10 Lever Arch Files. Durable board files with a mottled cover, large label area, metal shoes, eyelets to hold the file closed and a finger pull helps to retrieve your files easily. Size: Foolscap. Q-Connect Lever Arch File Paperbacked A4 Green (Pack of 10) KF20040 Pack of 10 Q-Connect Paper on Board Lever Arch Files. Colourful and practical, manufactured from recycled board and paper covers. Features large label area on the spine, thumbhole for easy retrieval, locking slots and metal shoes to protect. A4. Colour - Green. 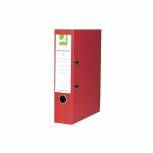 Q-Connect Lever Arch File Paperbacked A4 Red (Pack of 10) KF20041 Pack of 10 Q-Connect Paper on Board Lever Arch Files. Colourful and practical, manufactured from recycled board and paper covers. Features large label area on the spine, thumbhole for easy retrieval, locking slots and metal shoes to protect. A4. Colour - Red. Q-Connect Lever Arch File Foolscap Black (Pack of 10) KF20002 Pack of 10 Q-Connect Lever Arch Files. Durable board files with a mottled cover, large label area, metal shoes, eyelets to hold the file closed and a finger pull helps to retrieve your files easily. Size: Foolscap. 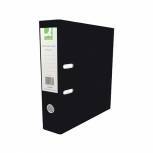 Q-Connect 70mm Lever Arch File Polypropylene A4 Black (Pack of 10) KF20019 Pack of 10 Q-Connect polypropylene Lever Arch Files. Smart, durable coloured lever arch files with finger pull for easy retrieval and large label area on the spine for quick identification. perfect for colour co-ordinated filing systems. Size: A4. Colour - Black. 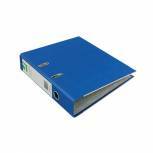 Q-Connect Lever Arch File Paperbacked Foolscap Blue (Pack of 10) KF20030 Pack of 10 Q-Connect Paper on Board Lever Arch Files. Colourful and practical, manufactured from recycled board and paper covers. Features large label area on the spine, thumbhole for easy retrieval, locking slots and metal shoes to protect. Foolscap. Colour - Blue. 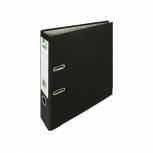 Elba 70mm Lever Arch File Oblong A3 Black 100080747 Pack of 1 High quality A3 board lever arch file with compressor bar and 70mm capacity. Ideal for use with A3 Punch Pockets. A3 oblong Black. 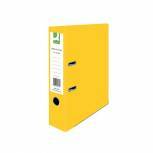 Q-Connect Lever Arch File Paperbacked A4 Yellow (Pack of 10) KF01470 Pack of 10 Q-Connect Lever Arch Files. Manufactured from durable recycled board and cover paper. 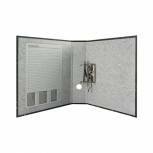 Features include a finger pull for easy retrieval, large label area on the spine, locking slots for extra security and a quality lever arch mechanism. A4. Yellow. 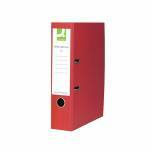 Q-Connect 70mm Lever Arch File Polypropylene A4 Red (Pack of 10) KF20021 Pack of 10 Q-Connect polypropylene Lever Arch Files. Smart, durable coloured lever arch files with finger pull for easy retrieval and large label area on the spine for quick identification. 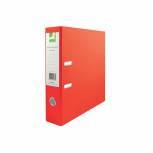 perfect for colour co-ordinated filing systems. Size: A4. Colour - Red. 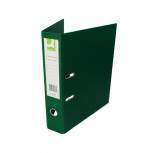 Q-Connect 70mm Lever Arch File Polypropylene A4 Green (Pack of 10) KF20022 Pack of 10 Q-Connect polypropylene Lever Arch Files. Smart, durable coloured lever arch files with finger pull for easy retrieval and large label area on the spine for quick identification. perfect for colour co-ordinated filing systems. Size: A4. Colour - Green. 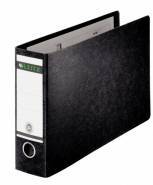 Leitz 180 Oblong Lever Arch File A3 Black (Pack of 2) 310680195 Pack of 2 Lever Arch Files manufactured from recycled Black board with Blue Angel environment endorsement. 77mm spine with protective cover sheet. A3 Oblong. 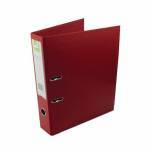 Q-Connect Lever Arch File Paperbacked Foolscap Red (Pack of 10) KF20031 Pack of 10 Q-Connect Paper on Board Lever Arch Files. Colourful and practical. Manufactured from recycled board and paper covers. Features large label area on the spine. Thumbhole for easy retrieval. Locking slots and metal shoes to protect. Foolscap. Colour - Red. Q-Connect 70mm Lever Arch File Polypropylene Foolscap Red (Pack of 10) KF20027 Pack of 10 Q-Connect polypropylene Lever Arch Files. 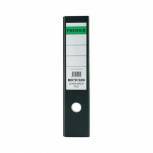 Durable coloured lever arch files with finger pull for easy retrieval and large label area on the spine for quick identification. perfect for colour co-ordinated filing systems. Foolscap. FC. Red.